At last, another addition to my Tyke Bites series, where I feature a random day of meals for my two-and-a-half year old quadruplets! 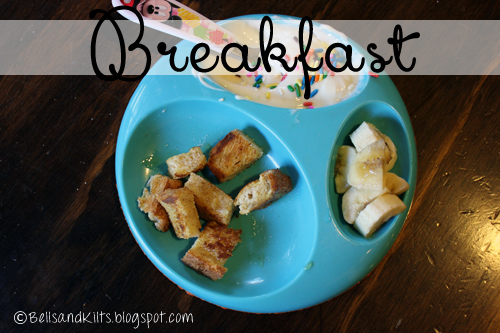 I enjoy sharing meal ideas with other parents—and have been slowly adding even more things to try to my Tot Food board on Pinterest—as it can certainly get stale serving the same thing to kiddos over and over. Granted, at this age they can become quite particular about the foods they will and absolutely no mommy i will not eat it! But I've made a point to feed them a well-rounded diet, including loads of fruits and veggies, since they were introduced to spoon feeding. I also made all of our baby food and I have no intention of letting all that hard work go to waste. So I do my best to maintain meals that are as wholesome as I can manage, while still featuring fare they'll actually chew and swallow. Including my sweet little redhead who truly loves nothing more than her carbs. Breakfast was a tried-and-true combo of homemade French toast drizzled with honey, full-fat strawberry honey Greek yogurt topped with a few sprinkles and bananas. All the quads are on the skinny side, so I add calories where I can! The kids love mac and cheese—who doesn't! ?—and I always make Annie's organic versions. They have been the most successful. Occasionally I add a little pepper or other seasoning. They also ate pineapple and cucumber and carrots with ranch. Dinner was some pan-seared steak seasoned with Worcestshire, minced onion, sea salt, garlic powder and pepper, topped with some melted butter. I paired it with roasted potatoes, steamed broccoli, strawberries and bananas. We typically do a snack in the afternoon after their nap, which ranges from white cheddar popcorn and whole grain goldfish with raisins to granola bars or their latest craze, chex mix. Got some food ideas? Have a trick to sneaking in more veggies? I'm all ears! 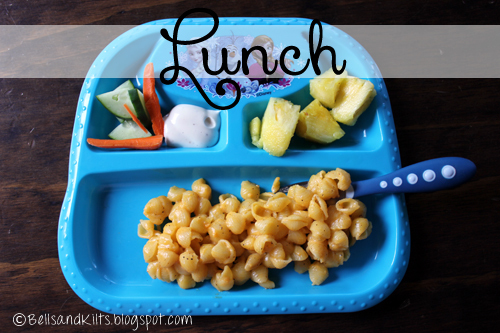 And don't forget to check out my Tot Food board on Pinterest and even send me some of your favorite kid-friendly pins. 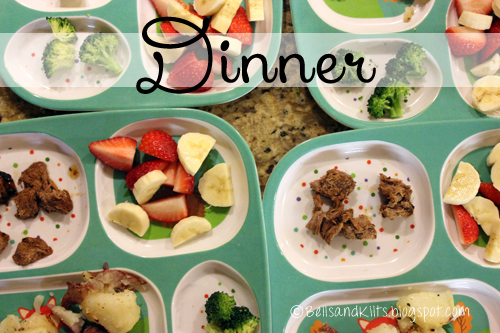 Those kids eat better than I do! I should get you to make up my menus. I know from following you that you have fed those children well since they first started eating solid food. You are a great mom, Amber. When do you think you will stop cutting their food so small? Surely they can chew pretty good by now. Yes they chew great! The fruit is all in normal size pieces that we, as adults, eat. The steak was cut small because it is so chewy. They don't use knives so other things like French toast, sandwiches, etc we pre-cut. We are still working with them to not shove a ton of food in their mouths all at once. I doubt cutting steak is something a 2 year old is up for yet.